Myrrh and frankincense have had spiritual significance since ancient times and they also were adopted as medicines for physical ailments. The resins are best known through the story of the Three Wise Men (Magi) delivering gold, frankincense, and myrrh for the baby Jesus; myrrh was also used to anoint Jesus' body after the crucifixion by Nicodemus. 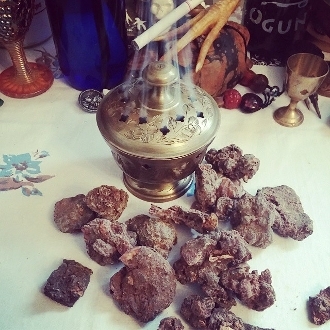 These herbs, valued like gold, were mentioned repeatedly in the Old Testament, in instructions to Moses about making incense and anointing oil, and in the Song of Solomon. Myrrh comes from a thorny shrub bearing small white flowers that grows in the Middle East, North Africa, and Northern India. It possesses a richly bitter scent. Prized for its opulent and enduring perfume, myrrh was seen as a magical substance that was capable of connecting heaven and earth. The Egyptians believed that the drops of resin were the tears of Horus, the falcon-headed sun god. Known as punt or phun, it was included in their sacred perfume Kyphi, burned at sunset as a thanks and offering to the sun god, Ra. The Egyptians also used it during funerals and in embalming rituals, as it was thought to accompany the soul on its journey to the spirit world and afterlife. The Hebrews drank wine flavored with myrrh to prepare them for worship. This exotic substance has been used in magic and religion for at least 4,000 years. You will receive one, 2x3 inch zip bag of pure resin with two charcoal briquettes to get you started! Enough for many uses!